One of the first challenges that almost all newborns face in this world is that they somehow have to make sense of this brand new visual world with nothing much more than blurry blobs of contrast to go by. Surprisingly, most manage, and the process itself is visually stunning when put into gif form. Recently Dr. Romesh Angunawela of Clinic Compare created an animation that sheds light on just what the world looks like to most of us in our first months. The animation shows a month by month view of what it is believed an infant’s sight would be like. This shows just how quickly babies go from seeing a nearly shapeless black and white world to the infinite variations of color, shape and light that you see at month 12. This brings up an even more interesting point. How do we know what infants are seeing? Beyond the obvious communication barrier, there are a number of other factors that make it difficult to tell just what an infant can see at each age. Most notably is that an infant’s vision changes constantly and varies drastically from person to person. Some infants who seem to be visually impaired in their early months can grow to have perfectly normal vision with the month. Researchers have still found a number of methods using response tests that are catered specifically for newborns. 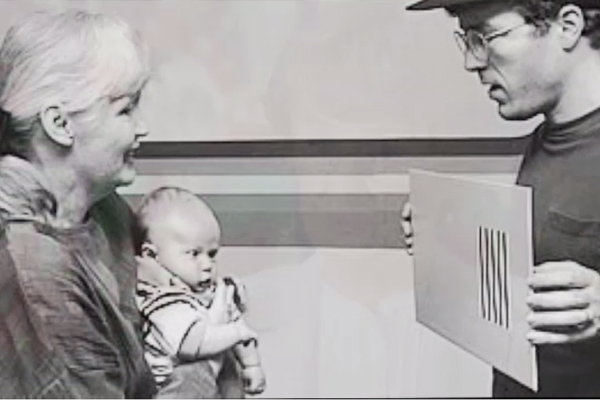 In the book Visual Impairments: Determining Eligibility for Social Security Benefits, the authors outline a number of other tests that can be used to test vision in infants. One of these is called the visual evoked potential test. The visual evoked response is an electronic signal that comes from the occipital cortex of the brain as a response to stimulation. The strength of this signal varies depending on the size of the pattern that is perceived. Observers can detect this signal by placing electrodes on the scalp just over the visual cortex. By using this, observers can present patterns and judge the smallest or most minimal pattern, color, or difference that will still evoke a measurable reading. The other is a procedure called forced choice preferential looking. This procedure is most often done using the Teller acuity card procedure. This test involves an observer watching the eye movements of the subject and using that as an indicator that the pattern or object was noticed. Using these methods, a tester would be able to vary distance, color, contrast, position and more to detect different abilities. Over many years of performing these tests, the results have brought us to an average understanding of what babies see at each stage. Fast forward to today and all of these tests and trials can be summed up into one simple animation that opens our eyes to our earliest months alive. Thanks science. Enter your name and email below to get occasional updates on our store, our articles, and our sales. The High Country's best choice for quality eye care and beautiful eyewear.